The CHATILLON LTCM-100 Series is an economical, motorized tester ideal for production environments, research & development laboratories, and quality functions. 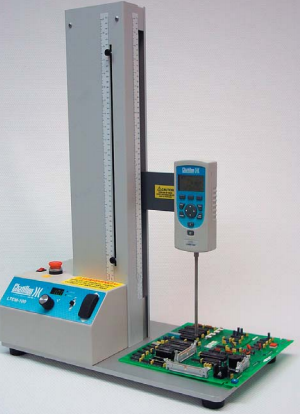 The LTCM-100 may be used for tensile, compression, peel, and flexural testing when combined with a Chatillon DF Series force gauge. A large working area and 5-inch (130mm) throat are perfect for large sample testing. The platform features pre-drilled holes for custom fixtures or for use with Chatillon fixtures. The crosshead travel is selectable in either inches per minute or millimeters per minute. The speed range is 0.2 to 20 inches/min (5 to 500 mm/min). A dial is used to set the speed requirement and a digital display indicates the speed selected to 0.1 resolution. Crosshead travel is 15 inches (380mm). An Up and Down switch is used to control crosshead travel direction. A simple switch setting can be used to reverse crosshead speed direction at maximum speed at the completion of a test. An emergency stop is located on the console for easy access. Mechanical limits may be set to stop crosshead travel at a specified position. Rules are provided on the front face and crosshead face of the column for accurate placement and for measuring extension. Positive braking ensures a precise stop.